Horse racing as well all know is one of the most closely followed and highly popular sporting events. Apart from the fun and excitement involved it, it is the money that it generates which makes people flock to horse racing in droves. Betting on horse racing is a business worth billions of dollars. However, to make money through betting it is important to understand the finer nuances or betting. Hence, it is common to see many punters and better using what is known as horse racing declarations. Let us learn more about it and look at some upcoming races and how are odds stacked up in a few races. What Are These Declarations All About? Basically, when we talk about these declarations, we are talking about race cards or small books which provide all information pertaining to various horse races. It gives full details regarding the number of horses taking part in the races on whomever day races are held, the names of the horses, the jockeys who are going to ride them, the owners, the track record of the horses and the jockeys and most importantly the odds for and against these horses as far as the races are concerned. This is a very important guide and helps punters and gamblers to take an informed decision to the maximum extent possible. The handicaps if any on horses are also mentioned thereby making it a complete and holistic piece of information. We will try and have a look at a few such declarations as far as the immediate racing fixtures are concerned. This will give a broad overview of the various important factors to be considered while betting on horses across various betting options. It will help be a bit more logical rather than trying to shoot some blank shots in the air and hope for the best. 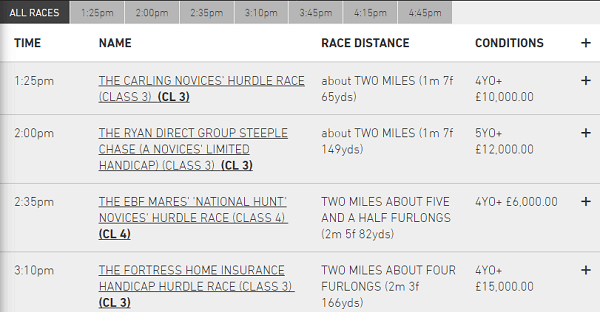 We will be basically looking at the races scheduled for the day at Dundalk. 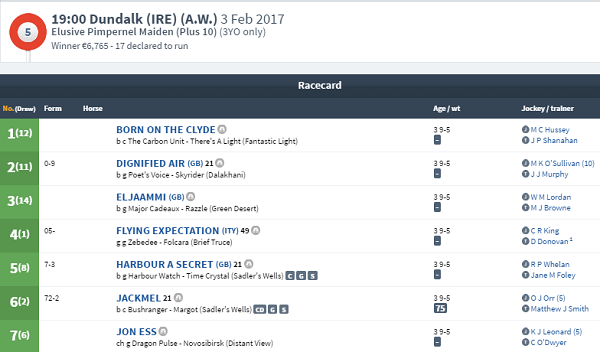 A total of eight races have been scheduled for the day, and they range from the first race at 16.30 hours known as Crown Plaza Race & Stay Rated Race to the last one at 20.00 yours christened as Dundalk Stadium race. Let us look at a few of the races which have been scheduled for the day and find out how the situation is likely to pan out as far as the day is concerned. The first race is likely to see a keen contest with seventeen horses in the fray. Each one is unique, but what matters are the odds that have been earmarked for each of these horses. The best odds are 6:1, and the most difficult odd is at 33:1. Though it would be difficult to pick up the favorite given the number of horses in the race, there are some reasons to believe that horses like Dance alone and EcoEye are the ones to watch out for as far as the winning post is concerned. For places, there are quite a few contents, and it could be anybody’s guess given the close nature of the race. However, there are many who would be willing to put their money on names such as Dance Alone and a few others. Hence, it would be better to wait till 16.30 and then find out who can walk away with the big winner money, which in turn will benefit the punters, gamblers and of course bookmakers. As mentioned earlier there will be a total of eight races in all starting from 16.30 hours and the last race will start at 20.00 hours. Elusive Pimpernel Maiden is another race which is evincing a lot of interest because of the quality of horses running. Further, the numbers of horses running are also comparatively lower at 14 which increase the chances of winning some prize money to that extent. However, based on the various horse racing declarations on Saturday information there are a few obvious things which come to the mind. Based on previous track record November Tale has a good chance, and therefore it comes with an odd of 7/4. Though there are many who are ready to put their money on Time Constraints, it has to be understood that the last time around in 2015, this horse came last. However, things have improved quite dramatically for this horse, and therefore many would like to bet on it for place win, if not for winning the race and the jackpot. Happy Company is also a horse which might be a dark-horse in the real sense of the term. Though it has an outside chance of 25/1 as per odds, there are many punters who believe that it might be able to spring a big surprise. Hence, the best way to go about it is to wait till 17.30 and find out which horse wins the first prize of Euro 7,702 whilst the second and third prize amounts are Euro 2,186 and 1,035. The fourth in the list will also be able to offer Euro 460 while the fifth one will give Euro 173. To be held on 6th January 2017 this is a big race not only locally but across the country. It will see 14 runners ranging from Johann Bach to Fastidious. This will perhaps be the most important race, though not for the prize money point of view. It is more of a prestige event because the total prize money across all positions should not exceed Euro 17,000 which is encouraging but not exactly mind-boggling, to say the least. Power Grid with a 9/4 odd is favored to win, but there could be a few surprises in the form of Song of Love and many more horses. Hence, when betting for places and combination one needs to be careful, and enough research needs to be done, and then action should be taken.